Regain the trust of your fellow Assassins. "You disrespected the Brotherhood. And it'll cost you." This quest is received after attacking a member of the Dark Brotherhood, accidentally or not. Pay a fine to Nazir to get back in the good graces of the family, which completes this quest. You cannot accept or complete any contracts until you pay the fine and Dark Brotherhood members will refuse to talk to you while suspended from the guild. The fine will be 500 gold if you are a regular member, but if you have completed Hail Sithis!, the amount will be reduced to 300 gold. The Spectral Assassin is considered a member of the Dark Brotherhood, so if you attack him to the point that he turns hostile then you will have to pay a fine. All contract victims are placed in the Dark Brotherhood faction at some point, and feeding on them as a vampire, or their corpse as a cannibal (with the Ring of Namira) may trigger this quest, though it won't actually begin until the next time you talk to a Dark Brotherhood member. Sometimes this quest might be triggered after you have fully upgraded the Dawnstar Sanctuary. 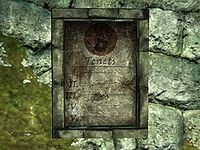 10 I have broken the rules of the Sanctuary, and must pay Nazir a fine before I can proceed with any Dark Brotherhood business. On the PC, it is possible to use the console to advance through the quest by entering setstage DBEviction stage, where stage is the number of the stage you wish to complete. It is not possible to un-complete (i.e. go back) quest stages, but it is possible to clear all stages of the quest using resetquest DBEviction. This page was last modified on 5 February 2018, at 21:24.